Good quality bedding etc - kitchen well equipped. Nice private rear garden area to sit in. Site very pleasant - nice pool etc . Great base for sight seeing . Had to purchase our own. These two bedroom, two-storey houses with one double and one twin, offer plenty of space for four guests and make perfect accommodation for families or friends. The spacious open plan living area is conducive for getting together and unwinding, plus there’s a modern and well-equipped kitchen for family catering. With the addition of outside decking areas, each house is designed with relaxation in mind. 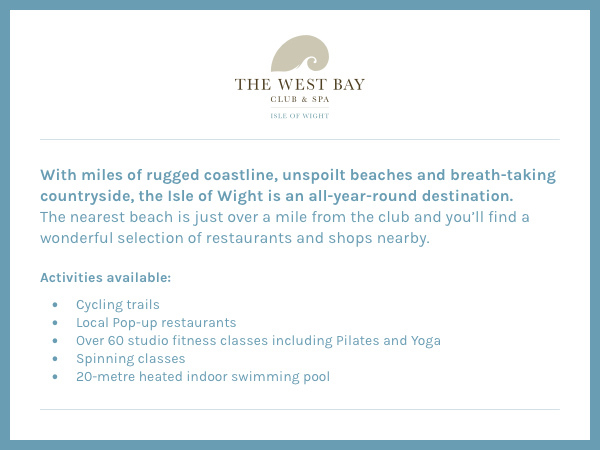 The West Bay Club & Spa is a unique destination offering an unrivalled experience for guests. The Country Club and reception are staffed by enthusiastic and knowledgeable staff who’ll work hard to make your holiday special. Whether you’re looking for total relaxation in the Island Wellness Spa or an adrenaline fuelled mountain bike tour around the west Wight, there’s an activity suitable for all ages. There’s a well-equipped gym, indoor pool, sports hall, games room and after all that, a quality café with superb, locally-sourced and healthy food. All of this within a short stroll of your property.